Seznep, Inc. was founded by Cindy and Jay Penzes. It is a small, woman-owned business located in Colorado Springs, CO. When you purchase from Seznep, you become our shareholders. You are the ones we strive to make happy. As noted in Our Commitment To Quality statement, “Our many years of experience working with military aircraft and maintenance personnel provides us with a keen sense of understanding and appreciation for the level of commitment necessary to achieve the desired end result”. This system has been reviewed by the Air Force, Navy and Army. 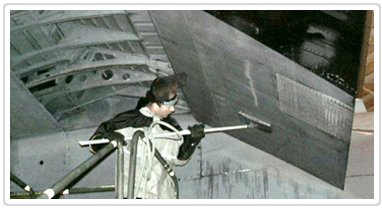 It is NAVAIR approved for several airframes and replaces traditional cleaning pads. The CDR Pad has a cleaning efficiency of 97% versus 63% for traditional methods. At Seznep, Inc. we believe creating value for our customers requires understanding their needs and meeting their expectations. Our many years of experience working with military aircraft and maintenance personnel, gives us a keen sense of understanding and appreciation for the level of commitment necessary to achieve the desired end result. By partnering our quality products and service with that degree of commitment, we promise we will consistently work toward meeting or exceeding the expectations of our customers.